Kobus tells that his first Springbuck hunt on his in-laws' farm was a real family outing. He was privileged to be allowed to hunt the single Springbuck, as the cold room was already filled with animals taken by previous hunters. So, along went wife, cousin, sister- and father-in-law. After a good walk-and-stalk, Kobus had his Springbuck in his sights - he took a low shot just in front of the left shoulder which exited through the right shoulder. Only the one shot was required. 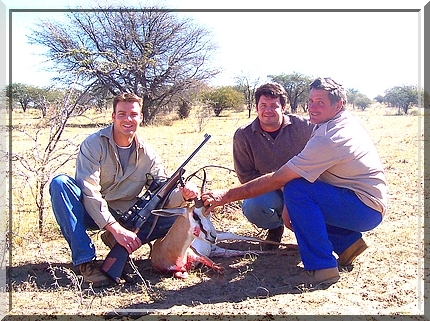 The shot was taken at 127m and Kobus was surprised at how much the animal had bled by the time he reached it. During the slaughtering process he noticed that the .270 calibre 110gr HV bullet had nicked the top section of the heart, damaged part of the lung and the shoulder bone, but with remarkably little meat damage, compared to another buck that was shot with a jacketed lead bullet. Kobus feels that he is now able to confidently hunt larger animals than before, using his .270 Win FN Sauer with 110gr GSC HVs.